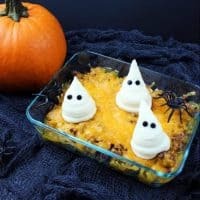 This quick and easy Haunted Shepherd's Pie makes the perfect Halloween dinner for your little ghosts and ghouls after a night of trick-or-treating. We all want to get some real food into our little ghosts and ghouls after (or before) they head out trick-or-treating. 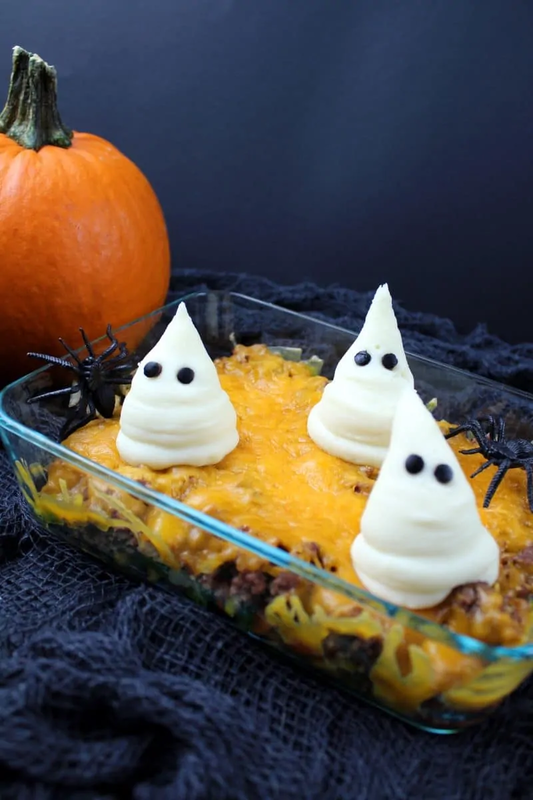 While pizza is often a popular option, there are ways to make healthier meals into something spooky. One option is shepherd’s pie. This is a recipe that not only contains protein, but vegetables as well. 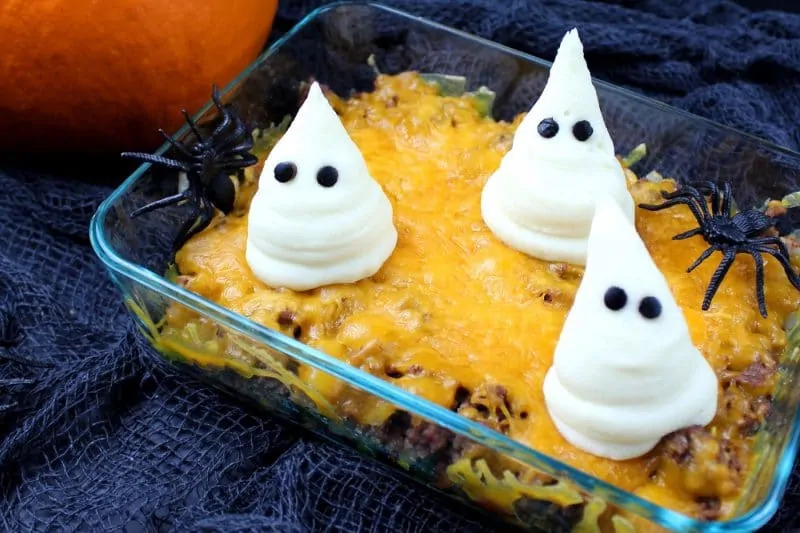 However, instead of simply spreading mashed potatoes on top, you can use the potatoes to make cute ghosts. This recipe is so much fun and allows for so much creativity. You can use fresh, frozen, or even canned vegetables and make the potatoes using instant or fresh potatoes. It all depends on how much time you have. 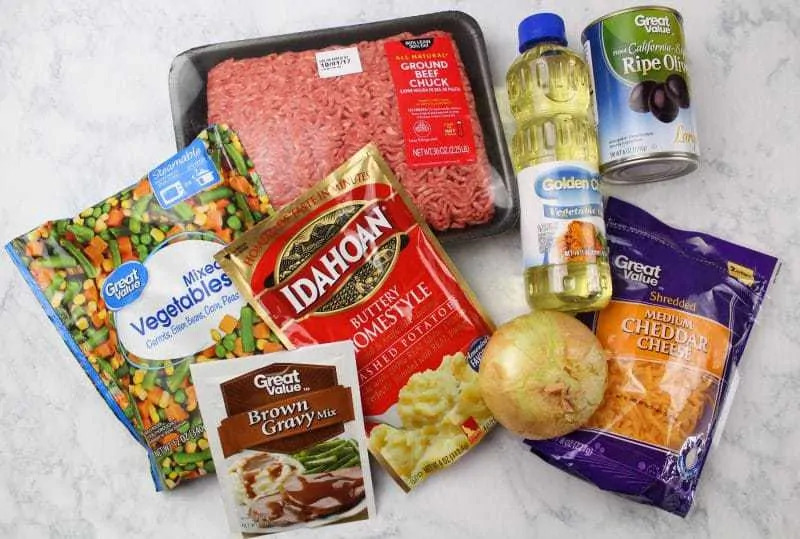 You also have the option to use extra lean ground beef or even ground chicken or turkey. In other words, you can make it as healthy as you want. 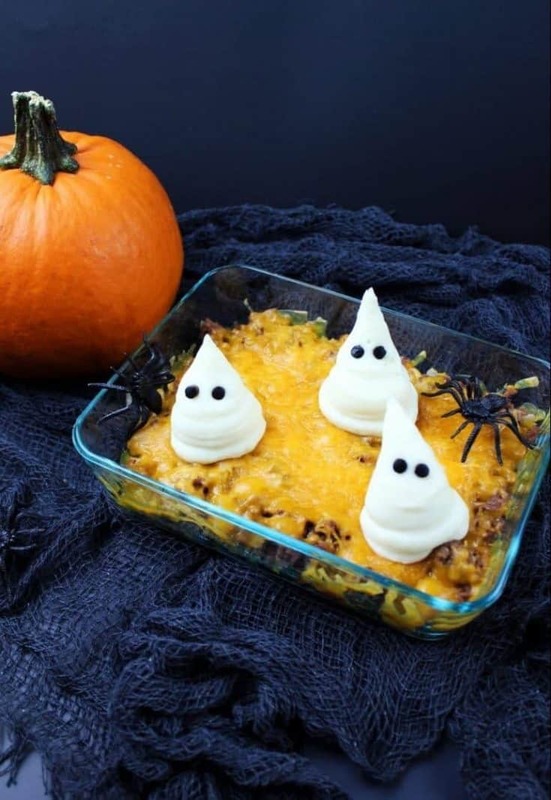 Your kids are going to love having a fun meal on the night of Halloween. You’re going to love that it’s a meal that isn’t loaded with fat and calories. That way you’ll be able to feel just a little bit better about all the candy and treats your little ones will scarf down after dinner. In a large skillet on medium heat, brown ground beef and diced onion. Cook until meat is no longer pink and onions are translucent. Drain and set aside. Boil frozen mixed veggies. Drain and set aside. Cook the brown gravy by following the directions on package. Layer a casserole dish with your meat and onion mixture. Add a layer of mixed veggies on top of the meat and onion mixture. Pour the gravy over the entire dish. Add cheddar cheese on top of the dish. Bake for 20 minutes at 350 degrees or until the cheese has melted. While the shepherd’s pie bakes, cook the instant potatoes by following the directions on package. Once cooked, place potatoes into a piping bag or ziploc bag. 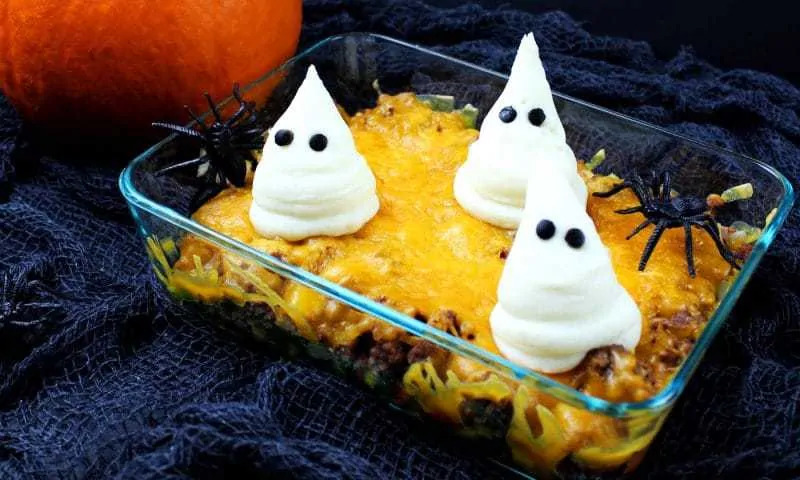 Pipe ghosts on top of the shepherd’s pie. If using a ziploc bag to do this, make sure you don’t cut too much of the tip off. Use a straw to punch out eyes from black olives. Place eyes on the ghosts. Enjoy! These are the cutest little ghosts I’ve ever seen. Perfect dinner before you go out trick or treating! Those ghosts are so cute! What a great idea. You make shepherds pie differently from me and I like your idea better, I’ll have to incorporate some of it next time. Thanks.